Plagiarism means 'wrongful appropriation' or 'close imitation' of an author's 'language, thoughts, ideas or expressions'. This can happen without intention. There are various guidelines that universities prescribe for citation of work, whenever you are referring to someone else's work or using a definition. Making sure that you have the right citation and format style is essential to save your dissertation from getting plagiarized. A plagiarism removal service becomes critical when you have used several references, or are studying a pre-existing research work. 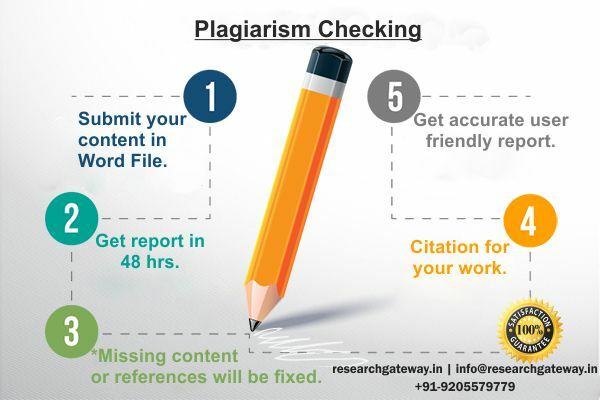 Research Gateway provides services for not just writing original research papers, but also to check for plagiarism in dissertation and thesis written by you. We use the best of tools to catch any traces of copying. It can very well be accidental, as the detailed research paper can have some parts or language that matches matter used elsewhere. Our plagiarism removal services are comprehensive and we rely on multiple checks to make sure there is no trace of uncertainty when we deliver you the research. We also provide you a report for the check conducted. It is not just a check of the language that we conduct. We also check the formatting style, research methodology and analytical tools. After all, these aspects can also amount to plagiarism. Especially when creating a technical work, like a medical research paper, you need to be very sure that the terms and definitions you are using are proper and you have given due credit for them. To prove that your work is original, it is best to have a proof in the form of a plagiarism report. Do not be stopped in your journey of creating a dissertation because of plagiarized content, which can also lead to rejection. Instead, get the help of a service for ensuring the authenticity of your work, as well as a positive response from peers and professors. Proving that your work is original and defending it is a crucial step in the process of evaluation of your work. This is because your professors would be using the latest tools for checking the originality of work. Hence, you must not leave any stone unturned to make sure that you don't falter at the last stage.